Summer doesn't officially start until June 21, but I'm already looking ahead to those hot and humid months. 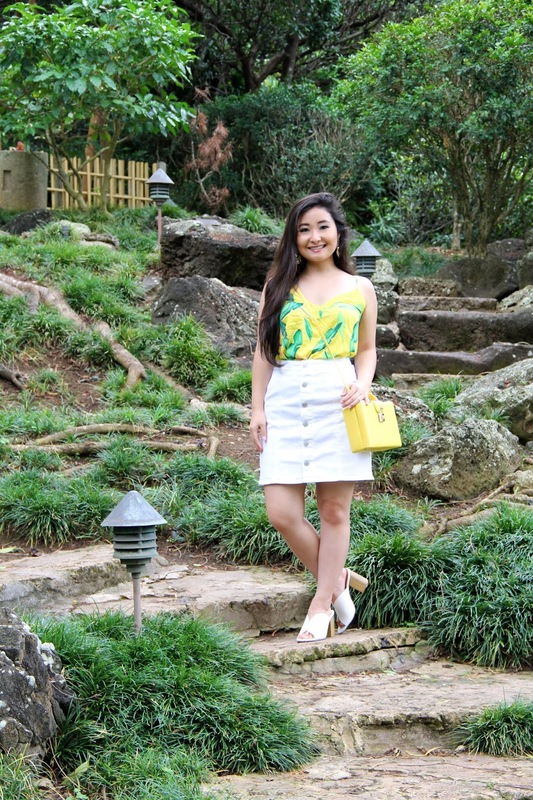 For this outfit post, I wanted to share with you a cheery tropical summer look that is not only cute but also budget friendly. Every gal loves and lusts after designer pieces, but there are affordable brands on the market that will keep you looking stylish without it costing a fortune. 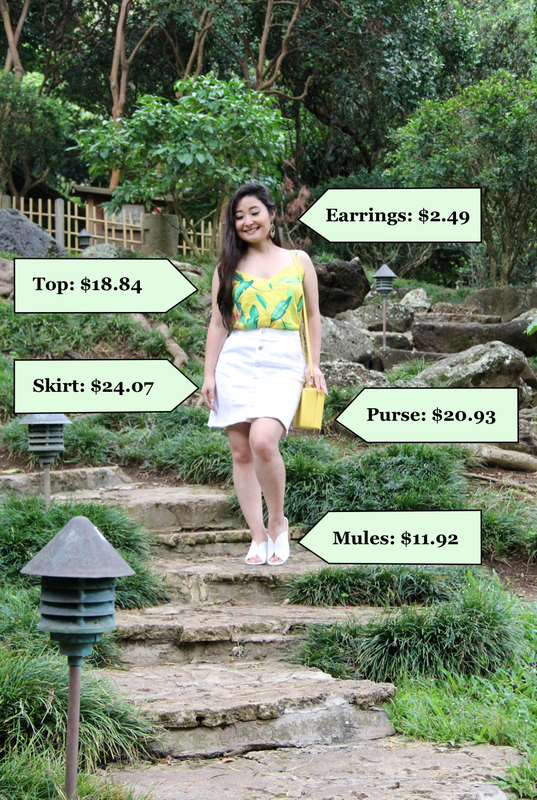 I challenged myself to style a summer look that costs $80 or under. Everything from head-to-toe had to be within budget, and that included accessories and shoes! You're probably thinking, "Shoes, too?" Yes, logically the shoes would be the most expensive item in this outfit, but surprisingly the heels were the second least expensive item. Oh, "How much?" you ask? Well, you'll just have to keep on reading! As a fashionista on a budget who loves everything from clothing to accessories to shoes, it definitely helps to be a savvy shopper. I enjoy shopping at Nordstrom and Bloomingdale's, but I also love shopping at Nordstrom Rack, Ross, T.J. Maxx, Zara and other stores that offer stylish pieces that don't break the bank. My new favorite store is . . . can you guess? Target! I purchased most of the items for this outfit from there, and I found the yellow purse at T.J. Maxx. The main pieces of this ensemble, the top, and the skirt are by the Target exclusive brand, A New Day. Their collections are so chic and very affordable! 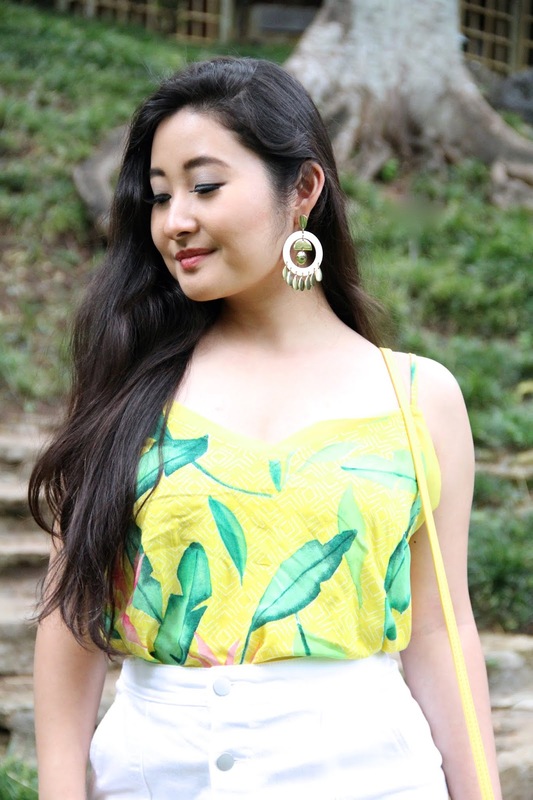 I thought this bright tropical printed camisole top was perfect for summer, and what better way to style it than with a skirt? I chose a white button-down denim skirt to tuck the top into and to highlight my waist so that the flowy material up top will not drown my figure. Also, a white denim skirt is a summer staple that I know I will wear quite a bit. The cost of the top and skirt summed up to about $40 (Top: $18.84 + Skirt: $24.07), I knew I had to be more frugal when it came to choosing the accessories. I still hadn't found the shoes for this look, so I was hoping to get lucky in finding an inexpensive pair of heels. To my surprise, I discovered these Who What Wear white mules in the clearance section. These were the exact shoes I had my eye on a month ago, but I left them on the shelf in hopes I would be able to purchase them when they went on sale. Well, I guess the stars were aligned and the universe was on my side that shopping day because there was only one pair in my size and they were only $11.92 with tax!!! Keeping the excitement going, I decided to try my luck at the clearance jewelry section in hopes of adding a hint of sparkle to this look since my heels were such a great find. I sifted through countless necklaces and bracelets before stumbling upon this pair of gold geometric earrings. Not only are they cute, they were on sale for only $2.49! Even if they didn't match the outfit for this challenge, I still would have purchased these baubles because I couldn't pass up this style steal! For the last and final piece of this outfit, I searched and searched for a purse at Target. Everything looked picked through and nothing seemed to match the bright tropical vibe, so I headed over to T.J. Maxx and I found this gorgeous structured purse. Not only did I adore the sunny color, I loved that it had a handle on top and hooks on either side of the purse so I can use it as a crossbody handbag. When you're on a budget, versatility is key. I ended up purchasing this beauty for $20.93, totaling this ensemble to $78.25! If I added everything correctly, I believe I am $1.75 under budget! In my eyes, this challenge was a success! 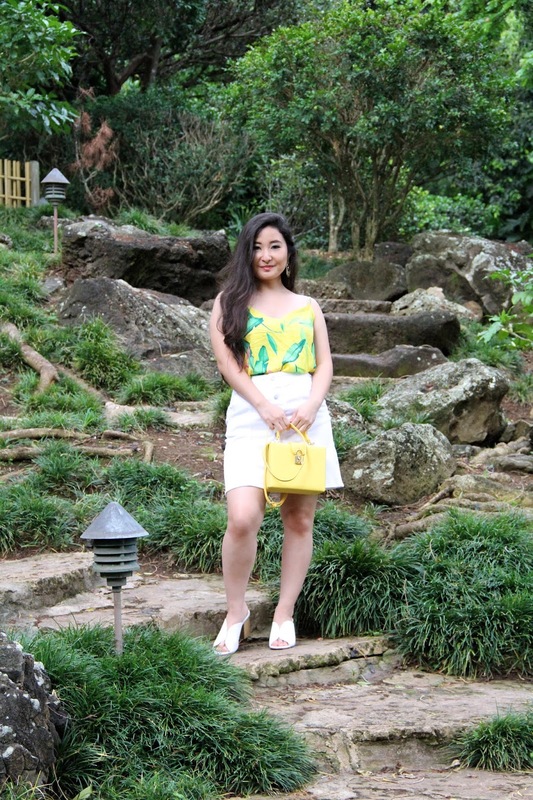 What do you think of this cheerful summer outfit? Is it a yay or nay? Also, be sure to let me know in the comments below if you enjoy these fashion challenge posts and if so, what challenge shall I do next? Thank you so much for stopping by my blog and, as always, I am sending you lots of love from my heart to yours!